Abstract: A graph is a mathematical construct that represents information about connections between pairs of objects. As a result, graphs are widely used as a modeling tool in engineering, social sciences, and other elds. The paper written by Leonhard Euler in 1736 on the Seven Bridges of Konigsberg is often regarded as the starting point of graph theory; and we have come a long way since. This talk will survey a few classical problems in graph theory, and explore their relationship to the elds of research that are active today. In particular, we will discuss Ramsey theory, graph coloring, perfect graphs, as well as some more recent research directions. Please refer to Queen's event page for more details: https://www.queensu.ca/mathstat/seminars/colloquium . 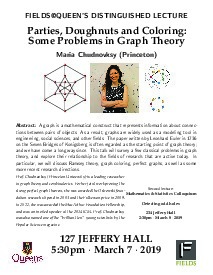 Prof. Chudnovksy (Princeton University) is a leading researcher in graph theory and combinatorics. For her joint work proving the strong perfect graph theorem, she was awarded the Ostrowski foundation research stipend in 2003 and the Fulkerson prize in 2009. In 2012, she was awarded the MacArthur Foundation Fellowship, and was an invited speaker at the 2014 ICM. Prof. Chudnovksy was also named one of the ”brilliant ten” young scientists by the Popular Science magazine.